In Excel 2016 Microsoft finally added a Waterfall chart option. It’s a great way to visually show the effect of positive and negative cash flows, on a cumulative basis. If you’re working in Excel 2013 or earlier version, please follow the instructions below as a workaround to build your own waterfall chart using the Up/Down Bars and Error Bars features. Finally, at the bottom of the article, you can download our Excel Waterfall Chart Template. To learn more, launch our Excel training courses online. Under Series Options, change Gap Width to 50%. Do the same for the Start & End column series. 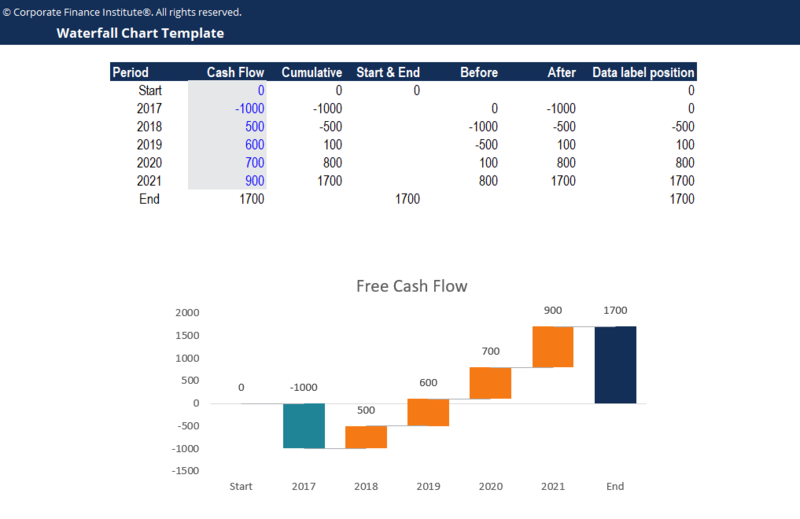 Change Chart Title to “Free Cash Flow”. Remove gridlines and chart border to clean up the waterfall chart. Right-click on the waterfall chart and go to Select Data. Add a new series using cell I4 as the series name, I5 to I11 as the series values and C5 to C11 as the horizontal axis labels. Right-click on the waterfall chart and select Change Chart Type. Change chart type of the data label position series to Scatter. Make sure the Secondary Axis box is unchecked. Right-click on the scatter plot and select Add Data Labels. Uncheck other boxes for Label Options. Select Above for Label Positions. Right-click on the scatter plot and select No Fill and No Outline to hide the scatter plot. Select the Y error bars (vertical bars) and delete them. Right-click on the error bars and select Format Error Bars. Under Error Bar Options, select Plus for Direction and No Cap for End Style. For Error Amount, select Fixed value and type 1. Change the error bars outline to grey color. Right-click on the connector series and select No Color and No Outline to hide the data points. Remove the legend to clean up the waterfall chart. Below is a preview of the waterfall chart template. Feel free to use this template to present the results of your financial analyses! These charts can be especially effective for making professional powerpoint presentations and pitchbooks. List of Excel formulas and functionsExcel Formulas Cheat SheetCFI's Excel formulas cheat sheet will give you all the most important formulas to perform financial analysis and modeling in Excel spreadsheets. If you want to become a master of Excel financial analysis and an expert on building financial models then you've come to the right place.